When investing in new or used equipment won’t work for your company, renting is your best solution to receive top-quality machines for any job at hand. Louisiana Rents in St. Rose, LA offers flexible and cost-effective options for industries that range across the board. We are one of the largest rental fleets in North America and will exceed your expectations by developing beneficial partnerships. The St. Rose location for Louisiana Rents gives you access to a variety of heavy equipment machines as well as attachments and generator systems. We make progress possible for your business, whether a piece of equipment is out of service or you have a one-time project that requires a specific machine. Our solutions are not only cost-effective and efficient, but they are also flexible in that you can rent by the day, week, month or longer based on your job site requirements. Louisiana Rents in St. Rose is the single source near you for low-hour, high-quality Cat and other Allied equipment and attachments, plus complete power systems. If you’re unsure of what you need, our experts will assess your requirements and determine an economical solution customized to your application, industry and environment. Being cost-effective means you pay for the equipment you need instead of making a long-term investment in something you require for a short time. With the extra spending flexibility you receive by renting, you can allocate your money to other operations that are essential for productive business. You can also reduce costs and requirements when it comes to storage and transportation. At Louisiana Rents in St. Rose, our factory-trained technicians service and maintain each engine — making them ready to be put to any task upon arrival. We strive to obtain optimum operating conditions for all our Cat and Allied brand fleet of rental machines so you can get the most out of what you receive. Our professionals also provide expert guidance in identifying attachments and accessories that accommodate each engine. While our rental solutions are beneficial in and of themselves, adding work tool attachments boosts versatility even more. 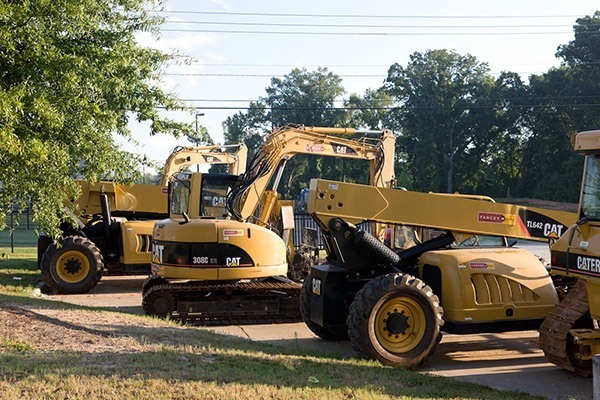 When you rely on Louisiana Cat and our rental equipment as your partner, you’ll receive full-service maintenance and support. You can even try out various models of heavy equipment, different attachments and a variety of generator systems to define what you want to invest in down the line. As a convenient way to view the equipment you need, you can download our Louisiana Rents mobile app as your portal to accessing Cat rentals. It is a simple way for you to review our extensive inventory. You can also request a quote, place an order or view directions to the closest Louisiana Cat location. Our Rentals are Ready When You Are! Louisiana Rents provides superior value for any equipment you rent whether you are in the construction, landscaping or mining industry. With our insightful customer service methods, we will assist you in figuring out what rental solution best fits your project and environment. We are your local and authorized Caterpillar® dealer in the region that accommodates a diverse marketplace demanding almost every Cat product for various applications. Contact a Louisiana Cat representative online or call us at (800) 766-4070. You can also call our specific rental number at (866) 843-7440 or view or rental product line.